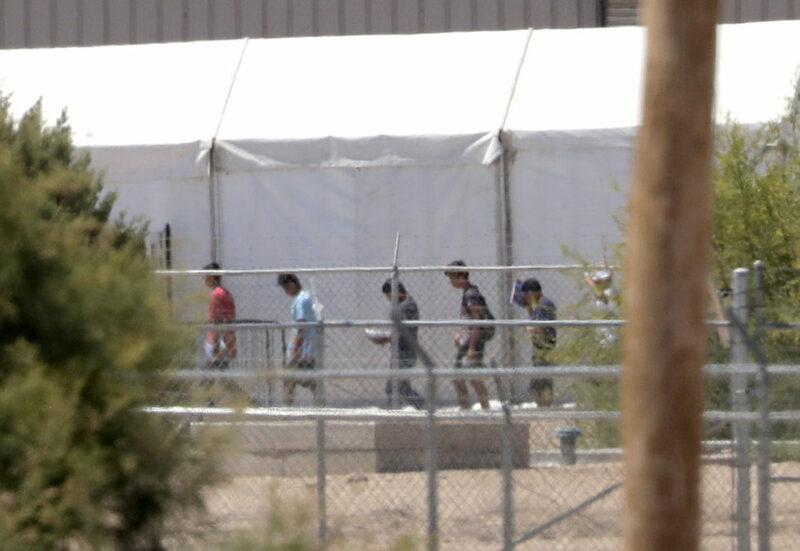 Detainees are seen outside tent shelters used to hold separated family members on June 22, in Fabens, Texas. Attorneys with the American Civil Liberties Union urged a federal judge today to swiftly reunite the thousands of migrant children and their parents who were separated after entering the United States. The ACLU asked U.S. District Judge Dana Sabraw to immediately order the government to reunify all separated children and their families within one month, and within 10 days for children under the age of 5. The ACLU also demanded the government provide parents a way to contact their separated children within a week, halt deportations of parents without their children, and stop future family separations except in cases where the child is in danger. More than 2,300 migrant children have been separated since the Trump administration unveiled in April its “zero tolerance” policy, which called for criminally prosecuting all adults caught crossing the border and sparked outrage across the country. Last week, President Donald Trump issued an executive order that officially ended family separations, but failed to address how the thousands of parents whose children were already separated from them will be reunited. According to the ACLU, the Office of Refugee Resettlement has no system in place to flag a child who has been separated from their parent or identify and track where the parent is being detained. The resettlement agency has a hotline number that is supposed to give parents information on how to find their children, but the hotline regularly puts people on hold for up to half an hour, making it impossible for most parents to get information from the government, according to the brief. The hotline currently has a constant busy signal, according to court documents. The emotional and psychological toll of separation on children can be catastrophic and lead to lifelong trauma, according child welfare organizations and medical professionals. The ACLU filed a class-action lawsuit in March challenging the practice of taking children away from immigrant parents on behalf of two asylum-seeking mothers whose children were forcibly removed when they were apprehended. Ms C. and her 14-year-old son fled Brazil and entered the U.S. in 2017. Ms C. told a border guard she was seeking asylum, but was prosecuted and convicted for entering the country without authorization. When Ms C. was sent to jail, her son was sent to a facility in Chicago and the two were only allowed to speak by phone a handful of times. The government must file a response by 9 a.m. tomorrow. Judge Sabraw said he plans to issue a ruling shortly thereafter.